The books I ordered from the Czech Republic arrived yesterday. They took two months to get here, but that’s fine – shipping that isn’t slow isn’t cheap. 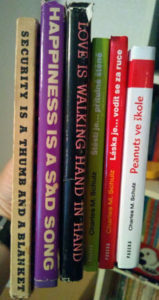 These books are 2007-2008 translations of Love is Walking Hand in Hand. 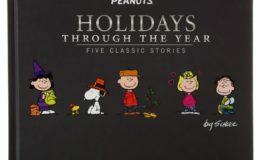 Happiness is a Warm Puppy, and Educating Peanuts. If you don’t recall that last title, don’t be surprised; it was a British book which took comments about school from the strip, making an image-and-a-line book similar to the other two books shown. The book does included the note that “in some cases, the captions have been paraphrased from the original wording,” which I find humorous, as I’m pretty sure that in no cases was the original wording in Czech. If you need some Czech in your collection, this is where I ordered them from.